There are many great reasons to choose ithlete, so many that we’ve written a blog series looking at why we do things the way we do. Follow the series to learn more about the type and length of measurement, how breathing influences your HRV and much more. 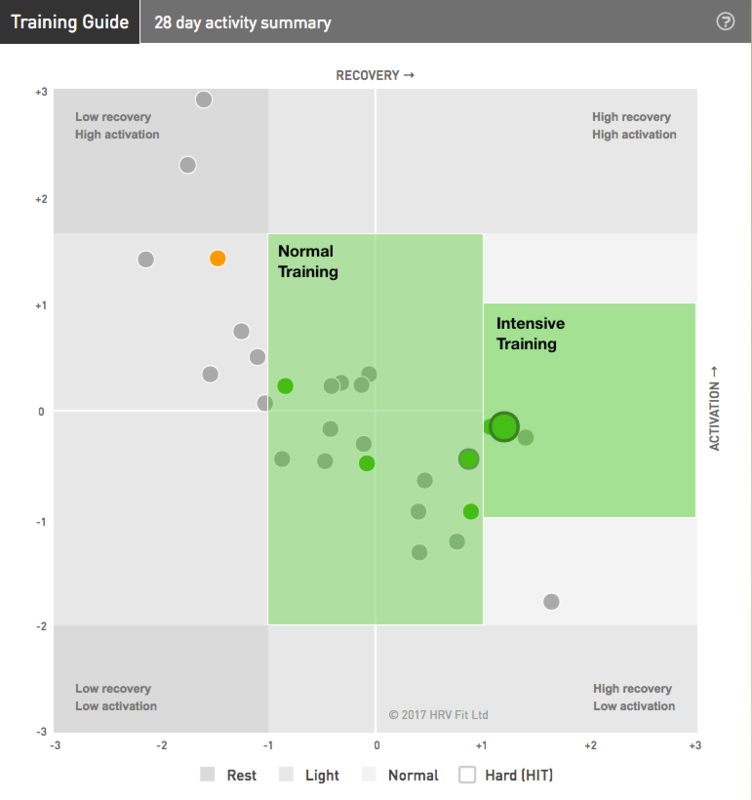 In an earlier part of this series we looked at how ithlete gives you traffic light recommendations for training, i.e. Green for go, Orange for caution, Red for stop. 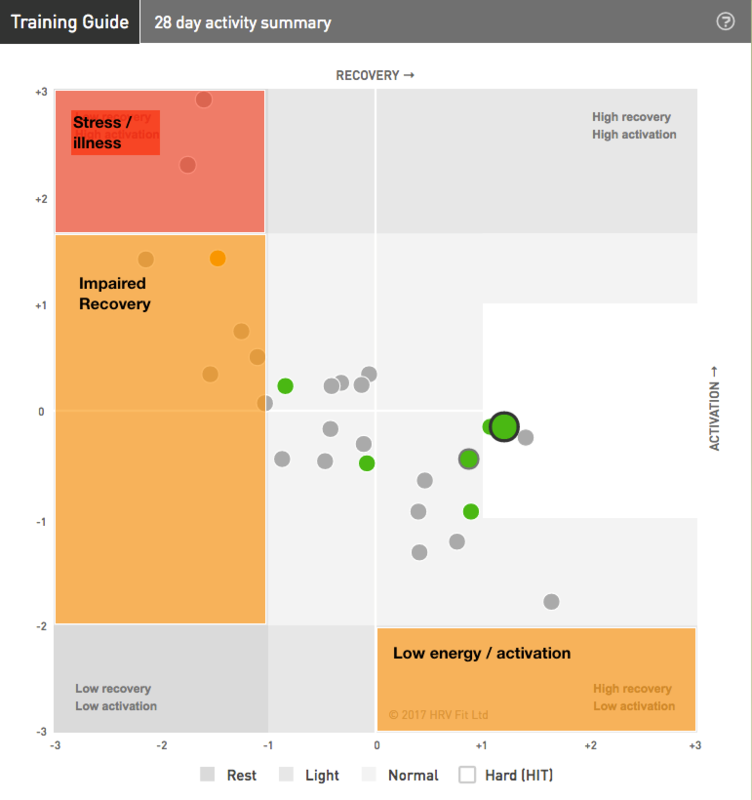 Orange, meaning not fully recovered, is a bit more difficult to interpret for action than Red or Green, however. What do you actually do with that information? How might you adjust training? Sometimes athletes will want to make the assessment of what they should do today based on more detail than the traffic light guidance offers. For this purpose, we developed the ithlete Pro Training Guide, which splits your current state into recovery (based on HRV) and activation (based on average RR interval). The Training Guide is a 4 quadrant map unique to ithlete that allows you to see whether it is energy, recovery or both you are lacking on a particular day, and how close you are to a boundary. It also allows you to see when you are in a well recovered, high energy state especially suitable for high intensity (HIT) training. By knowing whether it is your recovery or your activation that are outside your normal range, you can better decide how to modify your training. For instance, if you had a sweet spot, tempo or set of intervals planned and you were in the orange zone, you would probably want to decrease the length or intensity of the session. But if you were in the red stress zone at the top left, you would almost certainly want to postpone the session until another day, replacing it perhaps with light active recovery or complete rest. Some other examples to note are the orange (impaired recovery) zone to the left of centre, where you might feel fairly normal when you wake up, but should be aware that your body is not fully recovered. Whereas if you are in the orange zone to the bottom right, you are likely to feel calm, but tired and may have trouble managing high heart rate / speeds in training. Our users tell us that the more they use the Training Guide the more intuitive they find it, and the easier it is to know how to adapt your plans based on its guidance. Interpretation of these zones is also used by another ithlete Pro feature, the Simon Says artificial intelligence tool. Simon Says is an example of an expert, or knowledge based system, and takes account of your Training Guide zone, your trends and how you feel that day to give you an overall recommendation for the day. Simon Says offers actionable training guidance so you know how recovered your body is and what training you can take on today. We are constantly working to refine the recommendations Simon Says makes, and add more detail to the training.